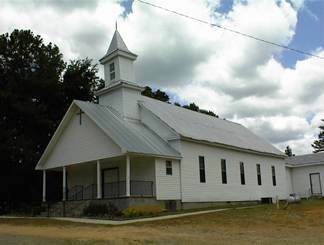 From the Hancock County Courthouse, go west 0.2 mile on Hwy 22. Turn right onto Dixie Rd (unmarked fork to the right). Go 0.6 mile and immediately after crossing the railroad track, turn left onto James Hunt Jr. Avenue. Go 1.0 mile. At the dead end turn left onto Pumping Station Rd. Proceed 3.5 miles to Hunt's Chapel Rd. on the right. Turn right and drive 0.8 mile. 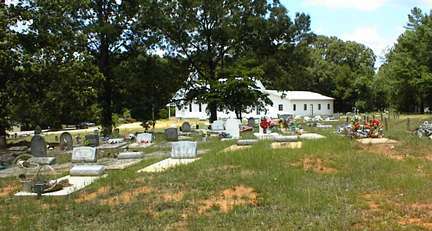 The church and cemetery are on the right. 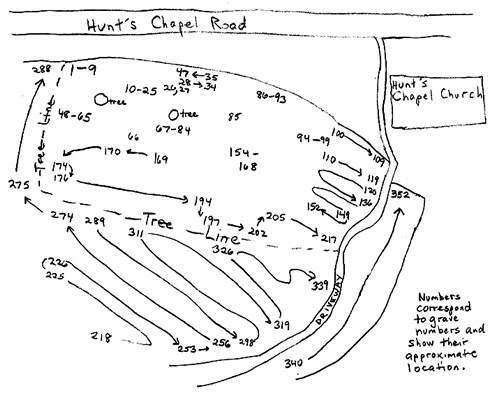 Graves numbered 400 or higher have been added since the original survey and are buried somewhere in the cemetery. At least 11 unmarked graves. Gravestone fallen over - probably a Willis. No death date at of June 2002. "Love Always Mom & Dad, 7 Brothers & 2 Sisters"
34 years old. Funeral home marker. Death year 19?3? Stone is crumbling and very difficult to read. Only date on marker is assumed to be death date and may also be birth date. SP 4 U.S. Army Persian Gulf War. "Our Beloved Son/Rest In Peace." w/o J. H. Laneir Sr. "Asleep in Jesus". Spelling is clearly "Laneir". In same lot with Katie N. Hunt. In same lot with Wilkins Hunt, Sr.
Age 85. Difficult to read. "Mother/Precious Lord Take My Hand." On same headstone as Connie Lois Rhodes. "Daughter" On same headstone as Willie Mae Rhodes. "In memory of son and daughter." Upright stone post as marker. "Heaven's Angel" No dates given. One and possibly another unmarked grave/s. Year of death is partially obliterated. Two unmarked graves. Nearby weathered funeral home marker reads: "Pat? dino? --? 17, 1925 - Dec 6, 1927" (faded). Slab large enough to cover three graves. Only date listed on marker is assumed to be the date of death. Day of birth is not clear. Age 69. "Father" On same marker as Della Harper. Age 62. "Mother" On same marker as James Harper. Only date given is assumed to be death date. Open area containing possibly 7-8 graves. Ingram Funeral Home marker on grave. Age 72. "K of P". "My Loved Son at Rest"
"My Loved Daughter at Rest"
"Wife - Mother - Grandmother"
"Grover" Rabbit head with bowtie engraved on marker. Five graves, two of which are enclosed by a fence. On same marker as Mary L. Hunt. No death date as of July 2002. On same marker as Albert Hunt, Sr.
"We will always miss you." Last name spelled "Rhode" - without the "s". GA PFC 425 Res Labor Bn QMC. Information taken from funeral home marker on unmarked slab. "Our Baby". "Life Over Here" [sic]. Edward T. "Larsh" Chatman, Sr.
On same stone as Annie Mae Warren. On same stone as Alfred Warren. Age 58. Grave not found in 2002. Could be unmarked grave 72 or 73. All info per Kimbrough. Age 64. All info per obituary. Age 65. All info per obituary and Social Security Death Index.